Game Planner Pro is football coaching software that was designed by successful high school offensive football coaches. The application is designed to be single entry game plan and playbook management. Enter your weekly game plan once, then effectively manage your practice sessions, game day call sheet and wrist bands (see screenshots & more info). Get this, our software was designed for football coaches (and by a football coach), so, there is nothing difficult about it. This is the easiest football coaching software EVER. Seriously, it is really easy to use. Enter your plays ONCE, and NEVER again unless you add more. Begin the week with your entire week’s game preparation completed. Print and share everything easily with your team’s coaches. From practice plans, to situational plays, to wrist bands and game day call sheet. Other coaches will have to work and game plan harder, while you work smarter. Your practices will be organized, your coaches will be better informed and prepared and your communication will be increased. Increased efficiency, organization and communication means better execution and more wins. You and your coaching staff can access the program from anywhere that you have access to the Internet. Mobile devices, tablets, desktops; it all works flawlessly. Plus, you can print your daily practice, weekly playbook, call sheets and Quarterback wristband sheets at any time. 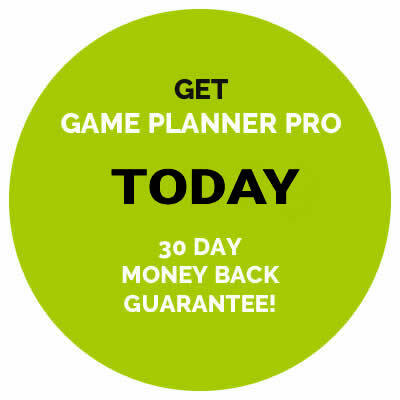 Get Game Planner Pro for $129 per year. Plus, there is a 30 day money back guarantee!